I shared yesterday on social media that the final signatures are finished and that I am so humbled and honored to announced that my upcoming book, September Caravan, will be released on September 1st, 2018. This book is my most personal yet...a collection of personal short stories (from 2012 to 2017), words of encouragement, and sweet inspiration on the concept of embracing grace and mercy when dreams are delayed and life is different than you imagined. 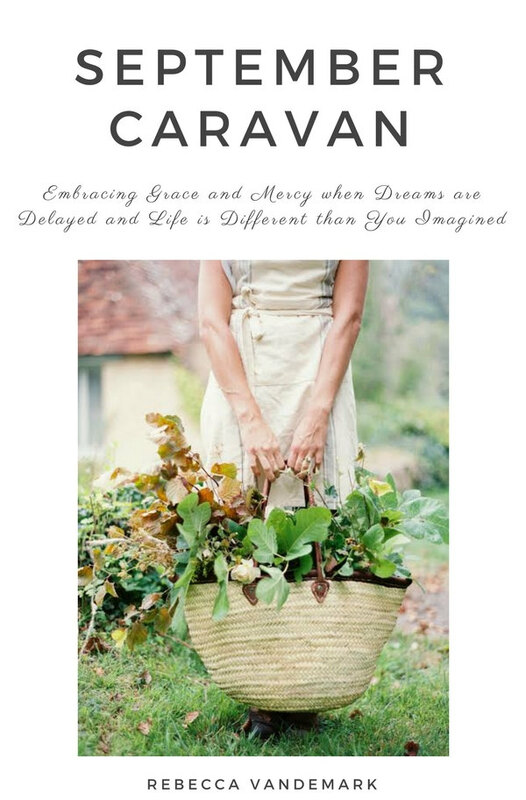 This book picks up where December Caravan left off and shares stories from my life as I learned to embrace the beauty of grace and mercy in the midst of loss of independence, long days in painful hospital testing, days of pain and sickness, deep loneliness, and finding joy despite having dreams delayed and life looking radically different than I could have ever imagined in my early thirties. “My journey started in the harsh winter months of December but really began in the simple changes of seasons in September. My book, December Caravan told the beginning of my story that started with my ex-fiance walking out on our engagement & ended in 2013 after my recent diagnosis of Advanced Late Stage Lyme Disease and Cancer among other illnesses. But the story had just begun, & I like many other people was about to learn the lesson of living where mercy beckons when life is brutal & harsh & learning to embrace grace when dreams are delayed & life is different than you imagined or hoped." This concept of mercy beckoning will change the way that we live, approach our relationships with God, and the way that we grieve & rejoice. Mercy beckoning encourages us that there is beauty that is found & grace that will meet us in the most difficult of circumstances. In the midst of the broken, the messy, and the painful, God carries us & whispers to the weary spirit, gently reminding us that God’s grace is there when our dreams are delayed & life is different than you hoped or imagined. Picking up where her well-loved book, December Caravan, left off, Rebecca shares stories from her life & learning to embrace the beauty of grace & mercy in the midst of loss of independence, long days in painful hospital testing, days of pain & sickness, deep loneliness, & finding joy despite having dreams being delayed & life looking radically different than she could have imagined in her early thirties. Rebecca shares the foundation of her hope gently reminding those who are desperately looking for encouragement and sharing the ways that mercy has beckoned to her broken heart these last several years. September Caravan will gently encourage you of the truth of learning to embrace grace when mercy beckons. It is a funny thing to share your heart with the world through a book... and to be honest I probably would have removed some parts because they are so deeply personal. But I am learning in new ways how being vulnerable, showing the beautiful along with the messy, reflects the heart of Christ in ways that I could never have imagined. As we allow Jesus to step into our broken and messy pieces, He beautifully restores and redeems the things that we wish that we could forget or "erase" from our past. So returning to this time period in my life brings a soft smile to my face... and to my heart. A smile of a knowledge that comes with personally experiencing that the Lord works intricately and personally in the deepest lows and in the glorious highs... all remaining so faithful and so loving. He is so good. If you would like to keep up with updates specific to this book please follow along at on my Instagram page which you can find HERE! I am going to be announcing the opportunity to be apart of the book launch team next year and will continue to update and share other ways you can be a part of this special project on the blog and on IG! Thank you so much for sharing in the joy of this exciting news! I hope you have a wonderful Friday and a wonderful weekend! I can't wait to read September Caravan!!! THANK YOU so much friend!!! SO humbled and encouraged by your words!! !